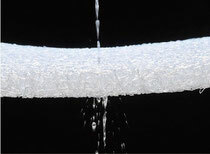 BreezeAir® contains materials surpassing those found in ordinary cushions. Breathability that will leave you breathless and weight displacement you can see with the naked eye. Thanks to its bacteriostatic manufacturing, it can be used in hospitals and nursing care facilities. Toss it whole in the washing machine, defying conventional wisdom. Light enough to carry it’s made with eco-friendly materials, and it compresses and reforms to fit your needs. These features comprise the standards of the next generation cushion. BreezeAir®: Making your life more comfortable with superior materials and quality. 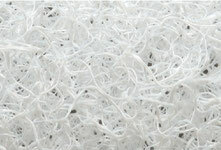 The surface of BreezeAir® looks like several overlapping white fibers. Depending on the angle it may even look instant ramen; however this is actually polyester thermoplastic elastomers. They hold the characteristics of both rubber and engineering plastics, creating a hard, resistant surface that is perfect for various kinds of manufacturing. BreezeAir’s design uses a 3 dimensional spring structure to evenly distribute weight across the surface of the cushion, allowing air to smoothly pass through, greatly reducing the amount of heat generated. BreezeAir® can be washed as is, just toss it into your washing machine. 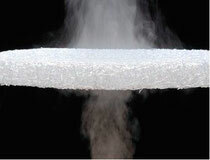 Its 3 dimensional shape is perfect for letting water drip off and drying. We promise a clean and comfortable experience. BreezeAir® avoids placing pressure on a single point, and instead evenly displaces weight across the contact surface of the cushion. This minimizes the amount of stress to your body as well as the stuffiness caused by cushion impressions. BreezeAir® compresses, reforms and maintains its shape, no matter how you use it. It’s also resistant to the temperature changes from season to season. BreezeAir® gently compresses to any point of pressure, and quickly reforms. Compared to polyurethane and other such materials, it prevents long-lasting impressions. Most ordinary cushions are simply thrown away as trash; however BreezeAir® is made green materials that release only small levels of noxious gas when burned and can be melted down and recycled. All BreezeAir® products are sold with a fast-acting odor removing BreezeBronze cover. Proven to fight the odor caused by sweat, it has been recognized for its high performance and given the Deodorant Processing Mark proving you a more comfortable experience.